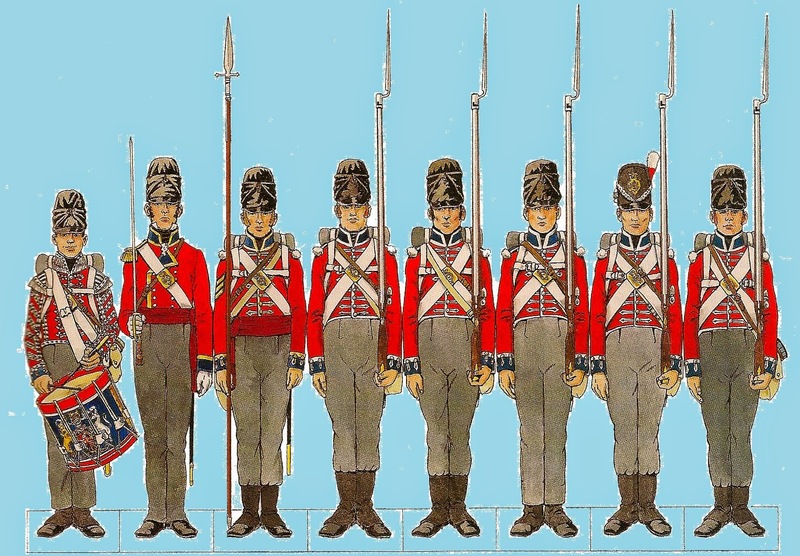 1st Foot Guards Regiment, 1815. 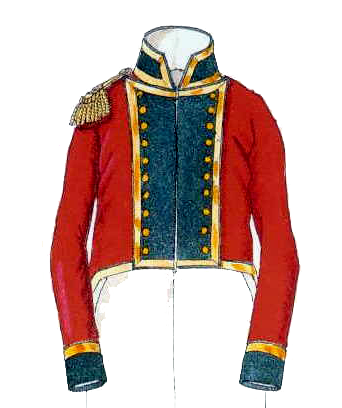 The 2nd and 3rd battalion of the 1st Guards Regiment belonged to the Major General Maitland Brigade of Major General Cooke’s 1st British (Guards) Division. 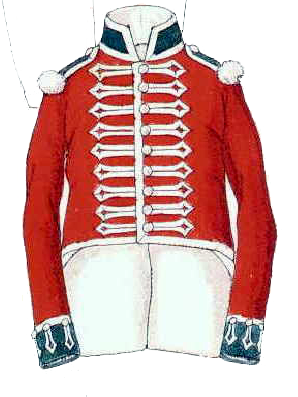 The Foot Guards were uniformed like the line infantry, but with regimental distinctions. 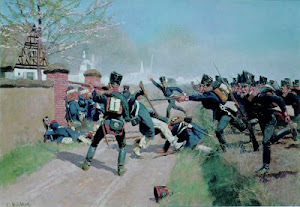 Facings of all tree regiments of guards were dark blue, with gold lace for officers. 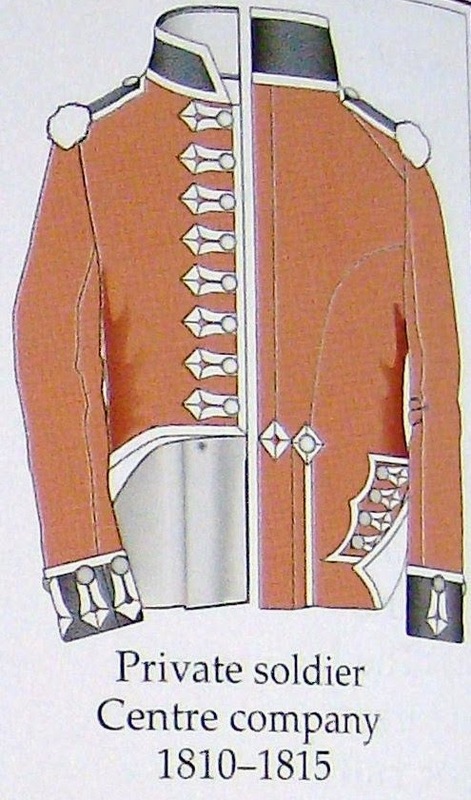 Sergeants also wore gold lace, while that of the rank and file was white, in regimental patterns; the 1st Guards lace was equally spaced, in “bastion” shape. The regiment carrying two regimental flags for each company. My unit carries the insignia of the Second Company of the 1st Battalion. My 1st Foot Guards contain 24 figures, including figures of the flank companies. Il 2° e 3° battaglione del 1° Reggimento delle Guardie, appartenevano alla Brigata del maggior generale Maitland della 1a Divisione (Guardie) Britannica del maggior generale Cooke. Le Guardie a Piedi erano vestite come la fanteria di linea, ma con le proprie distinzioni reggimentali. Le mostreggiature di tutti e tre i reggimenti delle guardie erano blu scuro, con alamari dorati per gli ufficiali. Anche i sergenti indossavano alamari dorati, mentre quelli della truppa erano bianchi, nei modelli reggimentali; gli alamari del 1° Guardie erano distribuiti uniformemente, a forma di “bastione”. Il reggimento portava due bandiere reggimentali per ogni compagnia. La mia unità porta le insegne della seconda compagnia del 1° Battaglione. Il mio 1° Guardie a Piedi contiene 24 figure, comprese le figure delle compagnie d’elite. 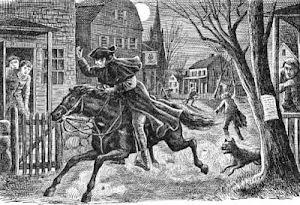 post bello e interessante come sempre! 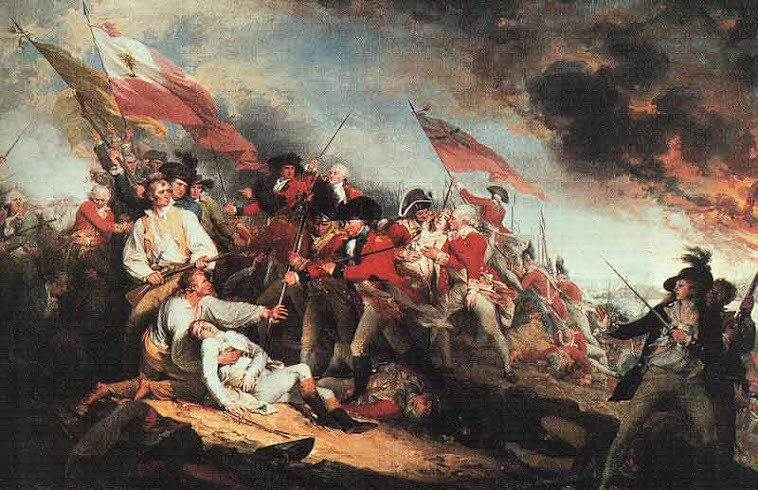 Your flags are on the wrong side, all the Guard's Regiments carried their union jacks on the left hand side. I am very sorry for the mistake. 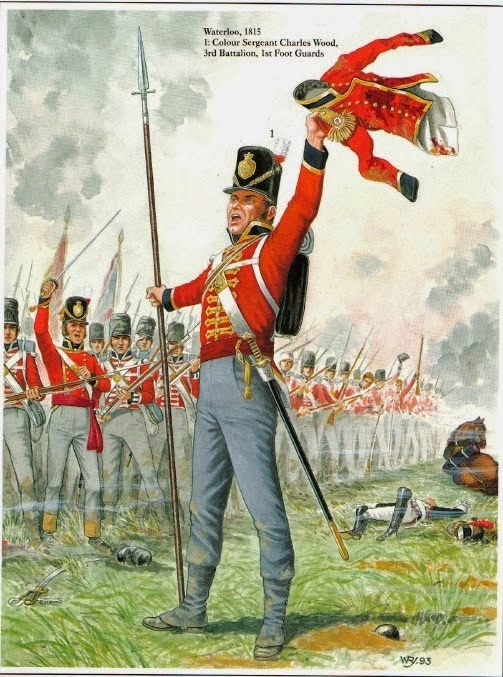 When I will do the 2nd or the 3rd Guards definitely put the regimental flag on the right and the Union Jack on the left. The reverse arrangement of the flags is a common mistake made by wargamers. If you keep an eye on my blog, I will be posting some photos of the 2nd Guard Regiment this evening. 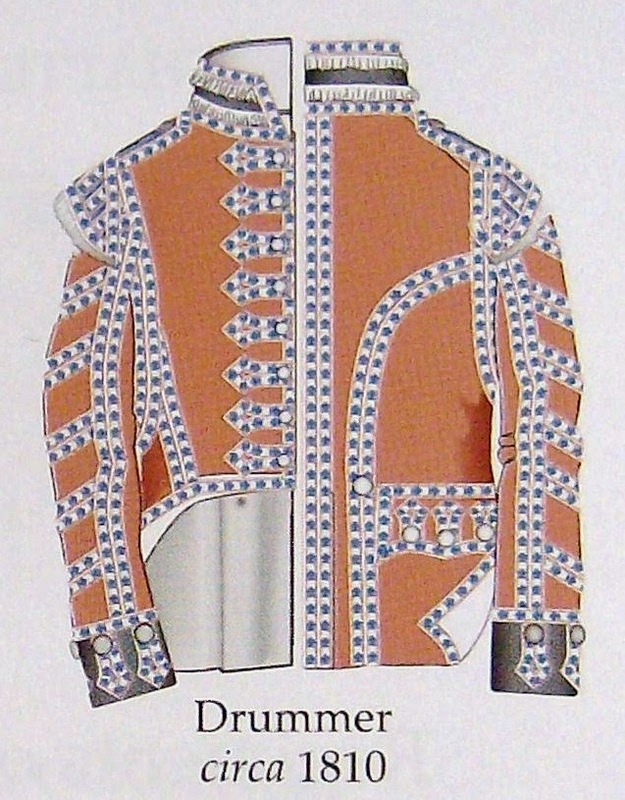 I admired your 2nd Regiment of Foot Guards on your blog. Of the pieces really interesting, very interesting to see the flags in the right way. 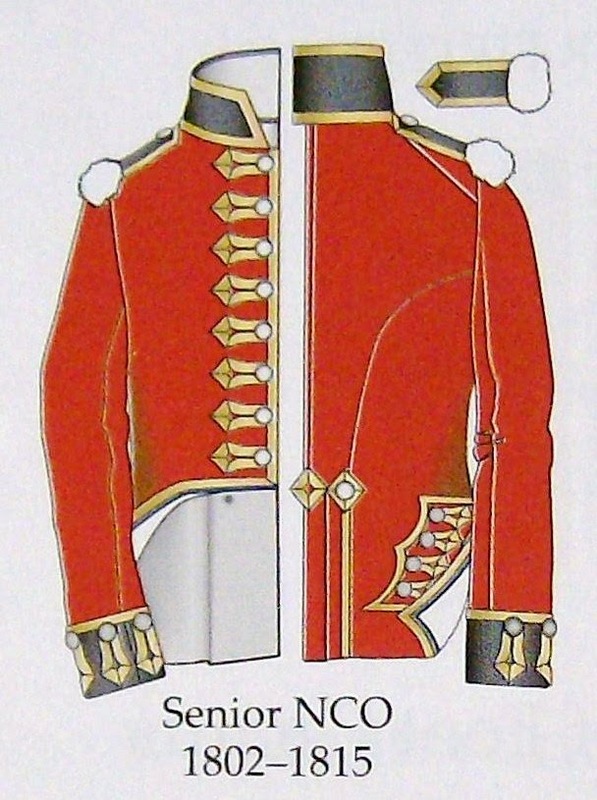 I wanted to make the 30th Regiment of Foot, but maybe I'll do that soon the "Coldstream" (of course with the Belgian shako for Quatre Bras).